It's not often we as players get the opportunity to directly participate in the development process of a game, be it indie developed or not. Furthermore: how often do we see decent studios have to shut their doors and throw out perfectly good game concepts and engines? 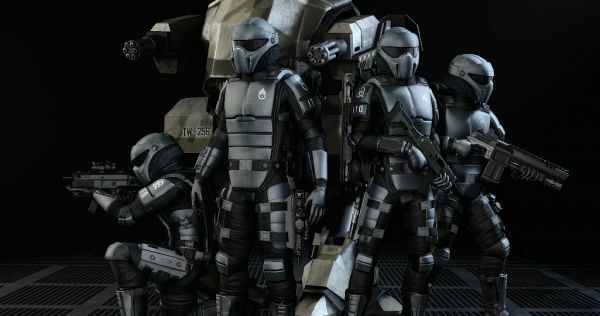 Zero Point Software experienced financial problems fairly recently, and nearly had to scrap the indie co-op title Interstellar Marines. Enough fans saw the value of the IP that upon Zero Point's request they were able to keep Interstellar Marines alive. The result so far is impressive - this is definitely one of the most intriguing stories in my time at Co-Optimus. Fans who pre-order the game can select one of two versions to buy: "Spearhead" or "Frontline." The former—which costs $39.00—will net players a copy of the entire planned trilogy, a unique unit identity in the game and on the website, and all sorts of goodies like digital wallpaper and free MP3 versions of the soundtrack. The second version goes for $25.00 and provides the same freebies, but only a digital copy of the first game in the series. Finally, players can simply pledge $5 and earn a "Support Medal" label, which will show up in their community identities. To keep the "shareholders" happy, Zero Point is incrementally releasing tech demos. They are then taking the feedback into consideration, effectively killing two winged aliens with one stone. "If enough people want [the game] on consoles and when Unity moves their technology to consoles (which they are) we will have Interstellar Marines on consoles as well," said [director Kim] Jørgensen. "We just need to convince Microsoft and Sony to serve the game digitally. We do not necessary (sic) expect the development to be completely parallel with the development on the PC version, but who knows." Co-Optimus' own Kat Pawlowski jumped all over this story last May, when the project was floating with the help of donations. Now that a pricing structure is in place, Zero Point is able to feed participating gamers with progress updates and the aforementioned tech demos. Comments outside of the developer's domain are mostly skeptical, but if the demos are anything to go by...Interstellar Marines is the game to keep an eye on (and if you're the venturous type...invest in). Page created in 0.4348 seconds.